Anyone driving onto campus from North Tryon Street between J.W. Clay Boulevard and Institute Circle will see something unique along the 18.6 miles of the LYNX Blue Line – a pedestrian bridge spanning the entire roadway. On Thursday, Aug. 25, construction workers erected the section that extends the pedestrian bridge from the median on North Tryon onto UNC Charlotte property. The extension is a special feature designed to enhance safety and convenience for UNC Charlotte users of the Blue Line. At other Blue Line stations, the bridges connect from a parking deck to the station platform, which typically is located in the median of a roadway; light rail users move back and forth from the platform to the parking decks via the covered bridge. For the J.W. Clay/UNC Charlotte Station, CATS and the University wanted something more. The first “half” of the bridge was erected in spring 2016 as part of the normal construction process. Last week, a tractor-trailer hauled in a single, 168-foot expanse of the final segment of the bridge, which was installed overnight connecting to another covered stairwell on UNC Charlotte property. From there, new sidewalks and paved pathways will provide accessible pedestrian entry to campus, as well as to the on-campus shuttle system. 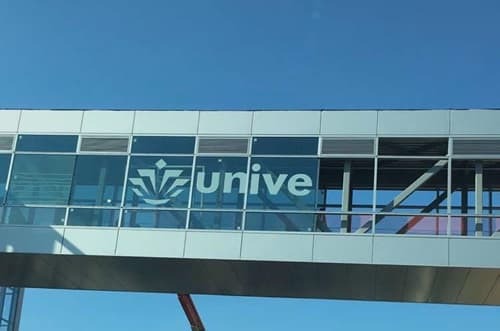 To give a sense of place for the community, the pedestrian bridge spanning both directions of North Tryon will feature the UNC Charlotte logo alerting visitors and drivers that they’ve arrived on campus. The light rail line is scheduled for completion next spring, followed by a few months of testing before it is open for business in August 2017. The University will be served directly by the J.W. Clay/UNC Charlotte Station and the UNC Charlotte Main Station along Cameron Boulevard near Wallis Hall; that station marks the terminus of the entire LYNX Blue Line. UNC Charlotte has launched lightrail.uncc.edu as a one-stop location for background information and updates on the project. Other recent light rail-related campus construction updates include the light rail tunnel beneath North Tryon and the continued work on the main campus station.